1. In the 1970's and 1980's, Great White Shark populations declined along the U.S., but have been on the rebound since the 1990's. 2. Hammerhead sharks are the most endangered shark species due to culinary demand for their fins in Chinese soup. 3. The fastest shark species, the mako, can reach speeds of 30 mph. 4. Some sharks can swim and bite in only ankle-deep water. Sharks can sometimes become accidentally stranded on the beach while chasing prey into shallow water. 5. Florida holds the dubious title of having more shark attacks than any other state in the United States. Volusia County and Brevard County on Central Florida's east coast have the most shark attacks than any other county in the Sunshine State. 6. Blacktip sharks are responsible for the most shark bites along the U.S. east coast, according to NOAA. 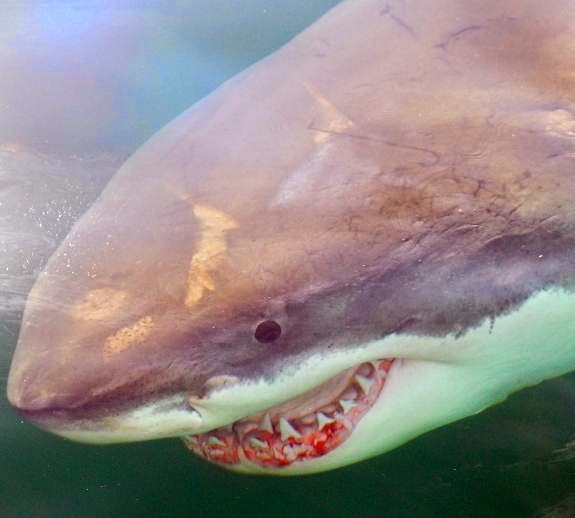 However, their bites rarely result in a fatality, according to the International Shark Attack File (IFAS). 7. The top three shark species responsible for fatal attacks worldwide are the Great White, Tiger, and Bull shark. 8. Bull sharks can live in both saltwater and freshwater. The Indian River Lagoon, which extends along Florida's east coast from southern Volusia County to Palm Beach County, is an important nursery habitat for baby bull sharks. 9. You are far more likely to die of drowning in the ocean (1 in 3.5 million) than to be bitten by a shark (1 in 11.5 million), according to shark attack statistics maintained by IFAS. Do not wander too far from shore --- this isolates an individual and additionally places one far away from assistance. Avoid being in the water during darkness or twilight hours when sharks are most active and have a competitive sensory advantage. Do not enter the water if bleeding from an open wound, and enter with caution if menstruating --- a shark's olfactory ability is acute. Avoid waters with known effluents or sewage and those being used by sport or commercial fisherman, especially if there are signs of bait fishes or feeding activity. Diving seabirds are good indicators of such action. Sightings of porpoises do not indicate the absence of sharks --- both often eat the same food items. Use extra caution when waters are murky and avoid uneven tanning and bright colored clothing --- sharks see contrast particularly well. Exercise caution when occupying the area between sandbars or near steep dropoffs --- these are favorite hangouts for sharks. Do not enter the water if sharks are known to be present and evacuate the water if sharks are seen while there. And, of course, do not harass a shark if you see one!